Root canals are needed to save a tooth that has a damaged or dead nerve. Root canals relieve pain, stop abscess infections, and save teeth. Root canals are not like the movies; it is a painless process. 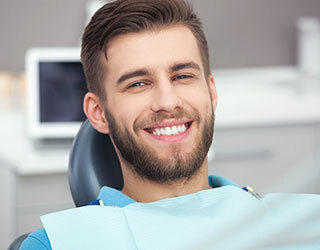 In terms of patient experience, once you are numb the process is very similar to filling a cavity except that the appointment is a little longer. The patient experience with a filling and a root canal is actually very similar, with the only difference being the length of the appointment. At Bay Hills Family Dentistry, we ensure that you are numb and comfortable. Cavities are caused by bacteria that dig through the layers of a tooth. At first, small cavities do not hurt because they are not close enough to the nerve at the center of the tooth. When the cavity grows it eventually causes intense pain to hot or cold, a sign that the nerve is damaged beyond healing itself. The nerve then dies and the patient experiences a temporary relief in pain until an abscess infection forms. Sometimes abscess infections do not cause pain, but they always have detrimental effects to our long term health. Abscesses are the result of infected or dead nerves, and root canals are the process of cleaning out the inside of an infected tooth to save the tooth and stop infection.